At CA Medicare, our friendly licensed agents can help you find the best health insurance plan to save you time and money. = Anthem Blue Cross offers a variety of Medicare options for Seniors. Before we get into the Medicare supplement and Medicare Advantage plans Anthem Blue Cross offers, let’s cover some basics about Medicare. Option 1: Original Medicare + Medicare Supplement (Medigap) Plan + Part D Prescription Drug Plan – Original Medicare consists of Parts A (hospital insurance) and Part B (medical insurance). If you choose to enroll in Original Medicare, you have the option of choosing a Medicare supplement plan to help cover costs for which Original Medicare doesn’t pay, such as copayments, deductibles, and coinsurances. Additionally, you have the option of enrolling in a Part D drug plan to help cover the cost of prescription drugs not covered by Original Medicare. Option 2: Medicare Advantage (MA) Plan – Medicare Advantage Plans become primary to Original Medicare (Parts A and B). If you choose an MA plan, you cannot also enroll in a Medicare supplement plan or a Part D prescription drug plan. Medicare Advantage Prescription Drug (MADP) plans can provide similar levels of coverage as Original Medicare combined with a Part D plan. Medicare supplement plans are numbered A through N. Here is a synopsis of some of the more popular plans available. Plan A is popular among seniors on a budget. Plan A covers the Medicare Part A hospice care coinsurance/copayment, Part A coinsurance and hospital costs up to an additional 365 days after Medicare benefits are used up, and 20% of the allowable Part B Medicare charges. It does not cover the Part A or Part B deductible, nor does it cover skilled nursing care coinsurance or foreign travel. Plan F offers the broadest coverage and is one of the most popular Medicare supplement plans. Plan F covers all of the following: The Part A and B deductible, Part A coinsurance and hospital costs up to an additional 365 days, Part A hospice care coinsurance or copayment, Part B excess charges, and foreign travel emergency services. Plan F is the most comprehensive plan available. High Deductible Plan F combines the benefits of Plan F, with a lower monthly premium, but a higher deductible of $2,240. This high deductible plan provides 100% coverage for all covered Medicare expenses once the deductible is met. Plan N is popular, as the premium is about one-third less than Plan F, and Plan N also covers the Part A deductible in addition to 20% of Part B charges. After the Part B deductible of $183 is satisfied, you pay only a $20 copayment for medical services. Plan N also has a foreign travel emergency benefit of $50,000. Plan G covers everything Plan F covers, except for the Part B premium. 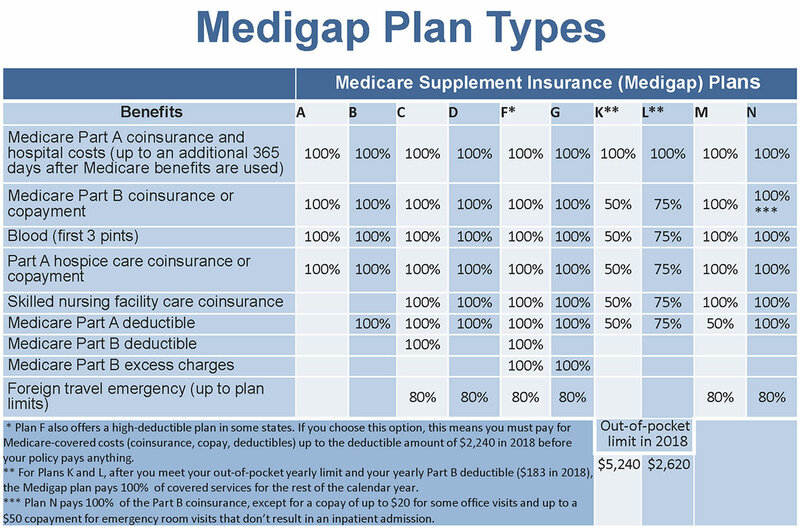 The chart below details all Medicare supplement plans, A-N.
Medicare Advantage plans are an alternative way to get your Medicare benefits through a private health insurance provider, such as Anthem Blue Cross. The plans are similar to the HMO and PPO plans that most of us are familiar with. As mentioned earlier, Medicare Advantage plans become primary to Original Medicare, but you must enroll in Original Medicare in order to get an MA plan. Here’s how it works: you enroll in Original Medicare Parts A and B, and pay the monthly Part B premium ($134 for most people in 2018). Then, enroll in an MA plan when you first become eligible for Medicare or during Medicare open enrollment, which takes place from October 15 through December 7 each year. Note that if you are enrolled in an MA plan, you cannot also be enrolled in a Medicare supplement plan or a Plan D prescription drug plan. It is important to ensure that the MA plan you enroll in fully meets your coverage needs. Our Medicare Wizard (Backlink to Medicare Wizard) can help you determine whether Original Medicare coupled with a Part D drug plan and/or Medigap plan is right for you, or if a Medicare Advantage plan will better serve your needs. Why Choose a Medicare Advantage Plan? Many people find that an MA plan better suits their needs, since some MA plans offer additional coverage beyond Original Medicare, such as vision, dental, and hearing coverage. Many MA plans have lower out-of-pocket costs than Original Medicare, and some plans offer prescription drug coverage (MADP plans). How Much Do Anthem Blue Cross Medicare Advantage Plans Cost? The experts at CA Medicare can help you find an affordable Medicare Advantage plan. To enroll in an MA plan, you’ll need to first enroll in Medicare Part A, which has no premium for most people, and Medicare Part B, which has a premium of $134 for most people in 2018. You could pay an additional premium beyond the Part B premium, depending on the plans available in your area. California residents: Some Southern California counties, such as Los Angeles, Orange, Ventura, San Diego, Riverside, and San Bernardino counties, offer zero copay plans, and many Northern California counties have low premium plans available. Call CA Medicare at 1-800-356-3615 and one of our friendly licensed agents would be happy to help you explore your Anthem Blue Cross options today.